Are You the Victim of Personality Discrimination? What do you think about your mom type? Do you like it? If you don’t know it yet, you can take the 9 question Mom Quiz now. Some moms love their type, others, however, don’t. Maybe you’ve been a behind-the-scenes woman all your life (Stabilizer or Improver), but wish you were more lively and outgoing. Or maybe you feel like you’re too talkative and silly (Connecter) or too honest and direct (Doer), and you wish you could be different. Perhaps you prefer solitude and silence, but then feel guilty because you’re not more social. It seems that the grass is often greener on the other side of the personality fence. I was there once, actually I’ve been there many times. In fact, just last week I was at a friend’s house thinking, Man, (because I grew up in the 1970s and still say stuff like that) I wish I could entertain like her. I wish I had that flair for hospitality that she has. I wish I actually liked to cook enough to have people over for dinner. But alas, I do not. It is fairly common to wish you were someone other than who you really are. We are a culture that constantly compares ourselves to others, so we end up feeling “less than” and start looking for an alternate personality. We beat ourselves up for our weaknesses. We resent our shortcomings. We wish we could share in the gifting of others, possessing what they have, because we are secretly dazzled by their talents. 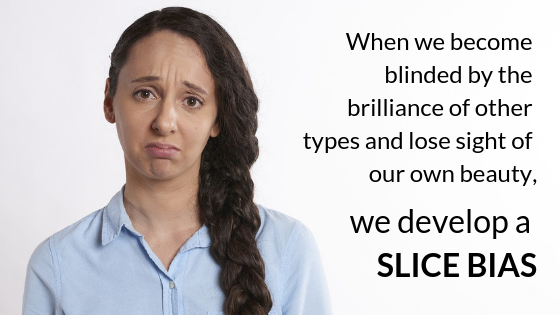 When we become blinded by the brilliance of other types and lose sight of our own beauty, we develop what I call a slice bias. A slice bias is a tendency to prefer one slice of the pie over another slice. It’s a fondness for one personality type and a disregard for another. Slice bias is based on elevating one set of traits over another, acknowledging the benefits of some characteristics, but not others. It’s picking personality favorites. Introversion—along with its cousins sensitivity, seriousness, and shyness—is now a second-class personality trait, somewhere between a disappointment and a pathology. Introverts living in the Extrovert Ideal are like women in a man’s world, discounted because of a trait that goes to the core of who they are. I also see a slice bias in the church, where women have historically been pressured to operate as grown-up versions of “sugar and spice and everything nice.” It seems like our religious institutions prefer that we conform to a man-made image (theirs) rather than the one we were originally intended to have (God’s). Women at church are often socialized to display the feminine qualities of people-oriented types (Connecters and Stabilizers) such as softness, hospitality, and caregiving, while moms who are naturally direct, assertive, and task-oriented (Improvers and Doers) are encouraged to tone it down. Me too, Missie. Me, too. Regardless of who squelches your inner you—your own inner critic, the culture you live in, or the people in your church—remember that God has already spoken in the way He designed your slice. He created your inmost being. Your slice has been fearfully and wonderfully made. Please don’t minimize your design. Can you imagine how much that would grieve the heart of God? Your slice matters. Your slice is needed in the whole pie. If you find yourself discriminating on the basis of personality, pray and ask God to help you see yourself the way He does, embracing the value of your design and the reflection of His image that He has gifted you to display.